There are many things to love about the Lexus LS 500: it’s comfortable, quiet, well-appointed and refined. But that’s pretty much always been the case for the LS. What surprised me, though, was the engine. I like the modern Lexus lineup quite a bit, but I’ve found that most of the powertrains feel behind the competition. There are a slew of naturally-aspirated V6s powering the crossovers and sedans, a lovely but archaic 5.7-liter V8 in the LX570 and a gloriously old-school 5.0-liter V8 in the GS F and LC 500. Sure, the hybrid entries are technically sophisticated, but the Japanese marque hasn’t offered anything to match the torque-on-demand modern mills that power the German competition. Lexus has finally dipped its toe into the waters of turbocharged power plants in cars like the GS and IS, but the Germans have each nearly perfected the smooth but powerful forced-induction motor. Forgive my surprise, then, when I first put my foot down in the Lexus LS 500 I borrowed this past weekend. 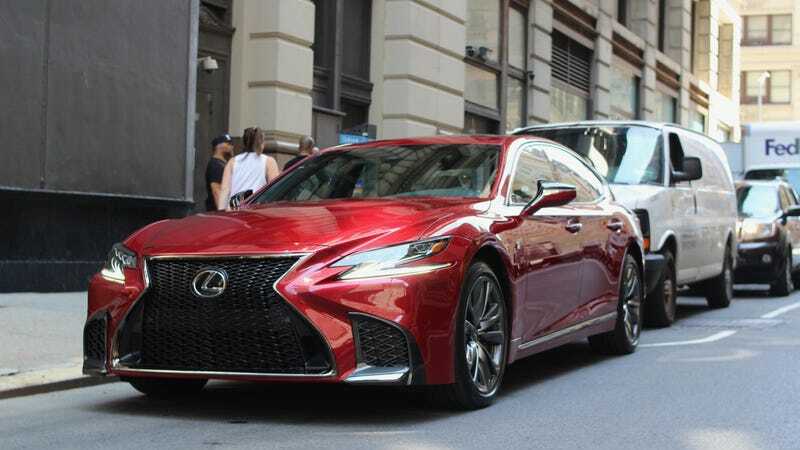 Despite the company being relatively new to putting turbocharged engines in luxury cars, the 3.5-liter twin-turbo V6 in the LS 500 is on par with the turbocharged sixes from Audi, Mercedes and BMW. The all-new six puts out 416 horsepower, a healthy 30-HP increase over the 4.6-liter V8 that powered the previous-generation LS 460 in rear-wheel-drive guise. More importantly, its 442 lb-ft of torque represents a massive 75 lb-ft bump over the outgoing naturally-aspirated motor. And because it’s a twin-turbo engine, it manages to deliver that surge of power down low in the rev range. Lexus has also mated it to the company’s excellent 10-speed gearbox, as seen in the LC 500. The combination of a torquey, powerful motor with ten quickly shiftable gears means that it’s nearly impossible to catch the LS off guard. On the windy back roads that lead to Connecticut’s Lime Rock park, the LS kept things subdued and quiet until I came upon a passing zone and dropped the pedal. Skipping a few gears on its way down, it dropped into the power band and surged passed the slower traffic. That’s the kind of behavior we’ve expected from top-tier luxury sedans for a while. Powerful when you need it, quiet when you want it and smooth always. While I love the high-revving monster V8 in the performance models, it’s nice to see that Lexus can nail the modern power plants that luxury buyers want for their cruisers. Unfortunately, I didn’t spend enough time with the car to give you the full review of something with this many features to play with. Luckily, TV’s Michael Ballaban is here to save the day and is planning a full review of the flagship sedan in the coming weeks. What I can say, however, is the down-to-the-bone basics of the LS 500 are better than they’ve ever been.